WDC Online - 2017 WDC Women in the Law Committee Clothing Drive! 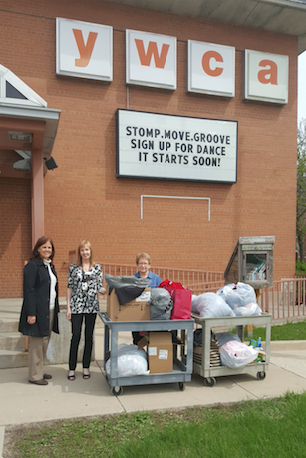 WDC’s Women in the Law Committee completed a successful first-ever Spring Clothing Drive. The group collected professional clothing items and distributed them to charities in five areas in the state. Shown are Heather Nelson (WITL Vice Chair) of the Everson, Whitney, Everson & Brehm, S.C. in Green Bay donating the Green Bay area donations to the YWCA; Gesina (Ena) Seiler of Axley Brynelson, LLP in Madison, who won the competition for the most items collected; and Laura Lyons (WITL Chair and WDC President) from Bell, Moore & Richter, S.C. in Madison, delivering the Madison-area donations to the Community Action Coalition. Thanks to all who participated and helped make a difference! Gesina (Ena) Seiler of Axley Brynelson, LLP in Madison, who won the competition for the most items collected. 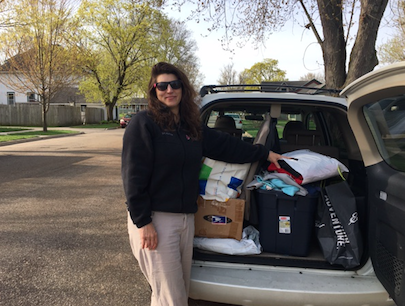 Heather Nelson (WITL Vice Chair) of the Everson, Whitney, Everson & Brehm, S.C. in Green Bay donating the Green Bay area donations to the YWCA. 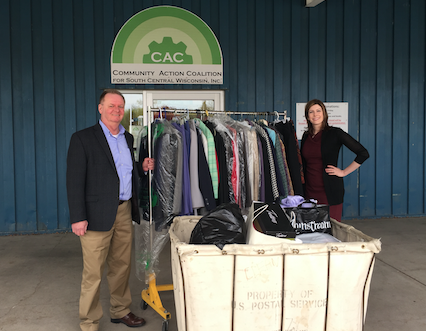 Laura Lyons (WITL Chair and WDC President) from Bell, Moore & Richter, S.C. in Madison, delivering the Madison-area donations to the Community Action Coalition.